I finished my small scrappy log cabin quilt. It is good to make one just for me, for fun, after making 4 complete quilts and working on at least 3 others last year, all for other people. Not the best photo, I'm working on that. I did not do a traditional binding because I wanted each side bound with a different fabric. I decided not to worry about the quilt police on this one. 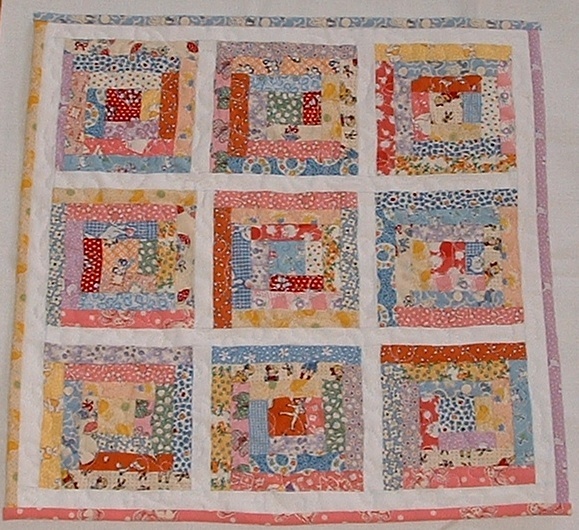 I did small swirly quilting all over. It was fun and easy. I pieced the back with some of the leftovers from my (small) 30's print stash. Next up, I'm working on a flouncy outfit for my niece. More cuteness! Turned out really cute Vicki! Oh my gosh. No, silly. It's just for me. I would love to have a girl baby some day, and you'll be the first to know when I'm pregnant (really! ), but I'm not now! 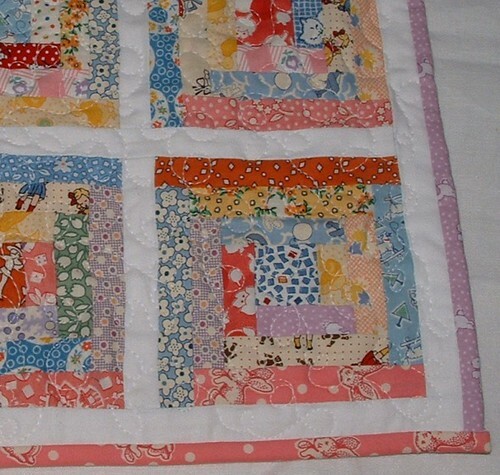 I really like the curvy quilting too. goodness, i love this!!!! what a neat idea to do the binding in four different patterns!! Love the little scrappy log cabin! Just stumbled on your blog today, I'll be sure to be back to read more! Question for you....did you "wing it" with the binding or have you seen a post/tutorial/book/article anywhere on doing the binding in four pieces? I teach beginner quilting and we're going to start teaching doing the binding in four pieces. But I need to learn how first! Yeah I just made up that binding as I did it. I bound the 2 sides first, leaving raw edges on the binding ends, and then when I bound the top and bottom, I kind of folded the ends in when I hand sewed it down, to cover up the raw edges from the other sides.